This is a community centre for people of all ages. You can have free internet access, which is available most days. This means you can gain hands on experience of using the internet and email. You can also make photocopies and send faxes here. It has all sorts of adult education classes and computing courses through the year. All courses run by High Trees Community Development Trust are free. For more information on their courses phone High Trees on 0208 671 3132 or follow this link to see what courses are running. You can also apply for a UK Online membership card which gives you access to use the internet. 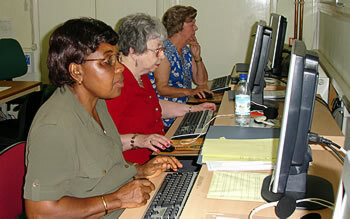 All the adult education classes run by Learn Direct are free (once you have paid a one-off £15.00 membership fee). Call Learn Direct on 0208 553 5961 to find out more. High Trees Community Development Trust is a well known local landmark. There is a drop-off bay outside the front door. There are not any reserved accessible parking spaces outside. Bus 2, 201 and 432 are the nearest fully accessible buses. Bus 2 is also a night bus. (Victoria Line) Brixton underground station is the nearest station, from there you need to catch a bus towards Tulse Hill. Tulse Hill mainline station is about 900 metres from High Trees. The main entrance to the reception is step free and very wide. It is very roomy inside. There is level access throughout the building. There is a fully accessible toilet in a unisex area. It is not kept locked. You can hire a meeting room for your group if you want. There are always staff members around who have first aid training.